Even an eco-labelled wood stove as polluting as 25 ten-year old diesel trucks! Tests by the Danish Ecological Council show that even an eco-labelled wood stove is as polluting as 25 ten-year old diesel trucks. UK air pollution expert Gary Fuller wrote in the Guardian: " Even modest wood burning in densely populated areas can lead to harmful pollution exposures comparable to those from traffic. Home wood burning needs to be addressed before more people invest in stoves or make open fires a feature in their living rooms." Extreme air pollution in Dublin caused by ‘burning of solid fuel’ Prof O’Dowd confirmed “extraordinary levels of air pollution” exceeding WHO guidelines were found in Dublin during one in five winter days last year. These occurred at night due to domestic heating activity, while daytime air pollution levels (mainly from traffic), reached less than 10 per cent of night time peaks. Diesel accounted for far less pollutants in the form of particulate matter than might be expected – at between 5 and 10 per cent. The most health-hazardous air pollutant is PM2.5 (tiny particles less than 2.5 millionth of a metre in diameter) that cause 10 to 20 times as many premature deaths as the next worst pollutant (ozone). PM2.5 penetrate the deepest recesses of our lungs. As well as causing lung disease, PM2.5 can enter the bloodstream and transport the toxins in air pollution all round the body, causing inflammation, heart disease, cancers, dementia, genetic damage in babies, increased risk of childhood asthma, autism, reduced IQ when children start school and attention problems. 0.4 kilograms less PM2.5 a year worth $980, so not installing a new wood heater worth $82,000!! New Australian standards add $980 to a $40,000 diesel SUV, but save “more than $1.5 billion in public health expenditure over the next 20 years” - see “Car pollution crackdown will save lives but comes at a cost”. The standard for diesel cars and SUV was reduced from 0.025 grams PM2.5 per kilometre (required 2006/07 onwards) to 0.005 grams/km, avoiding 0.02 grams per km, i.e. 0.4 kilograms per year for a car travelling 20,000 km annually. Avoiding 0.4 kg of PM2.5 per year is therefore worth at least $980 in reduced health costs. Woodsmoke is reported to be worse than car exhausts. New wood-heaters have real-life emissions of about 9.8 grams of PM2.5 per kg of firewood burnt. So a wood-heater burning Sydney's average of 3.43 tonnes emits 33.6 kilograms of PM2.5 per year. With an 0.4 kg reduction in annual PM2.5 emissions worth an additional $980 on the cost of a new diesel, not emitting 33.6 kg of PM2.5 a year by not installing a new wood-heater burning an average amount of firewood, is worth a whopping $82,354! Even if we could halve average emissions from a new heater, the estimated health cost would still exceed $40,000. The Senate Inquiry “Impacts on health of air quality in Australia” concluded that the failure to manage wood-heater pollution was “a failure of the technical committee to reach consensus within the meaning of Standards Australia's rules, which according to the minutes supplied to the committee was a result of opposition from industry representatives." What a terrible tragedy to have the health benefits of new vehicle standards undone by increased wood-heater use. As shown in the NSW EPA graph below (latest emissions inventory data – for the year 2008, published 2012), wood-heaters cause the lion’s share of Sydney’s wintertime health-hazardous PM2.5 emissions. Other major sources, road transport, industry, and non-road equipment are a much smaller fraction of the total. NSW has 4.8 million vehicles, many of which use Sydney’s roads. Tackling car pollution, but allowing just 70,700 households using wood as the main form of heating to damage the health of 4.6 million Sydneysiders seems like a short-sighed, inappropriate polity. Woodsmoke PM2.5 emissions increased from 4503 tonnes in 2003 (34% of PM2.5 emissions) to 5669 (more than half of Sydney’s PM2.5 emissions) in 2008. Emissions continue to increase – from 70,700 Sydney households burning wood in 2008 as the main heating to 83,000 in 2011 (ABS data). Do people know that new wood-heaters emit more PM2.5 pollution (the most health-hazardous air pollutant) than 1,000 petrol or 200 diesel cars, or are they deceived by slick advertising? Woodsmoke – the major source of pollution in mining towns! Wood-heaters are the major source of PM2.5 pollution in many locations. The mining town of Muswellbrook is close to the Bayeswater and Liddell power stations (which generate enough electricity for 3.25 million homes, slightly more than the total of 2.7 million households in NSW). Despite this, a small proportion of households using wood-heaters cause 62% of Muswellbrook’s wintertime PM2.5 pollution. The diagram below shows smoke from domestic wood heaters in yellow. Smoke from burn-offs and forest fires, shown in green, is the 4th largest source of PM2.5 pollution, evident mainly from August to December. At a recent Senate Inquiry hearing into Air Pollution Prof Higginbotham stated that breathing air at the standard of 25 ug/m3 was equivalent to actively smoking 3 cigarettes. One day in 2012, Armidale’s daily average PM2.5 from wood-smoke measured 65 ug/m3, as bad as forcing everyone – women, children, elderly residents, asthmatics and even babies – to smoke 7 cigarettes that day! With tests on mice and bacteria showing woodsmoke causes 12 to 30 times as many tumours and mutations as the same amount of cigarette smoke[4, 5], the health effects of involuntarily breathing woodsmoke must be at least as serious as voluntary active smoking. Many rural towns have high woodsmoke pollution. Armidale has about 20,000 residents. The local council stated in a submission to the Federal Government: “It is estimated that Council has committed more than $300,000 (excluding wages) in the past 10 years on wood smoke abatement measures.” Despite this, average winter (June, July and August) PM2.5 pollution for 2008-2010 was 15% higher than in 1999, and also substantially higher than in the mining town of Muswellbrook. Efforts to reduce pollution by removing old heaters were counter-acted by aggressive advertising from the wood heating industry. New wood-heaters, installed in new, insulated houses, are causing almost as much pollution as the old heaters that were removed. Tackling wood-heater pollution has tremendous health benefits. Deaths from respiratory diseases in winter fell by a whopping 28% and cardiovascular deaths by 20%, after Launceston’s $2.05 million program reduced use of wood-burning stoves from 66% to 30% of households. Many woodsmoke pollution programs fail because local people do not know that new wood-heaters are almost as polluting as older models, or that the average brand-new wood-heater emits as many in PM2.5 in the first hour of operation as the average modern passenger car in an entire year. Prof Piers Forster, lead author of the IPCC's AR4 chapter Changes in Atmospheric Constituents and in Radiative Forcing (setting out the scientific evidence that atmospheric changes are causing global warming) stated that "Reducing emissions from diesel engines and domestic wood and coal fires is a no-brainer as there are tandem health and climate benefits." Prof Drew Shindell, lead author of the Anthropogenic and Natural Radiative Forcing chapter of the IPCC's Climate Change 2013: The Physical Science Basis also chaired the UN Environment Program (UNEP) research that recommended phasing out log-burning heaters in developed countries to reduce global warming. A most significant threat to our planet is the warming that will occur in the next 20 years, while we develop cost-effective alternatives, such as wind, solar (with storage) and electric cars running off solar electricity. All these are likely to provide cheaper, cleaner alternatives within 20 years to digging fossil fuels out of the ground. Warming over the next 20 years (called short or near-term warming) is critical. The UNEP report explains "Near-term warming is pushing natural systems closer to thresholds that may lead to a further acceleration of climate change. For example, the melting of permafrost in the Arctic is releasing additional quantities of methane into the atmosphere, which in turn contribute to additional global warming". The Copenhagen target of limiting warming to 2°C will not be met without tackling near-term warming. In the first 20 years after emission, every kg of methane emitted from a domestic log-burning heater causes 88 times as much global warming as 1 kg of CO2, so because of the substantial quantities of methane they emit, log-burning heaters bring us nearer to exceeding the Copenhagen target than electric or gas heating for up to 12 similar houses. Earlier assessments (when the prospect of exceeding the 2°C target seemed a long way off), concentrated on warming over 100 years. This is no longer a sensible strategy. Even biomass power plants (that produce no methane) are now considered likely to increase short-term global warming. Domestic log-burning heaters are a much greater threat to the climate because of their methane emissions than biomass power plants. Unfortunately, the peak wood heating industry body, who lied to the Senate Inquiry about their key role opposing new wood-heater standards, also lies to consumers by quoting inappropriate, out-of-date studies that ignore near-term warming, and glosses over the fact that much of Australian firewood production is from unsustainable sources. Although Armidale (and some other councils) tried to tighten wood-heater emission limits, this had the paradoxical effect of increasing pollution, because real-life emissions from new wood-heaters bear little relationship to measurements from a perfectly-operated test model under laboratory conditions. The photo shows real-life emissions from a brand-new heater that meets Armidale’s stricter limit of 2.5 g/kg (laboratory rating under perfect operation). The NSWEPA’s consultancy report estimates that a heater rated 2.5 g/kg has real-life emissions of 8.2 g/kg so, as reducing 0.4 kg of PM2.5 is worth $980, not installing a new wood heater rated 2.5 g/kg that burns 3.43 tonnes per year is worth $70,315!!! Armidale’s “standard” for new wood heaters is like encouraging “light” cigarettes instead of giving up smoking. It lulls residents into a false sense of security, encouraging them to spend good money on a totally unsatisfactory product with similar real-life emissions to the heaters that Council is paying a subsidy to remove. With no safe level of PM2.5 pollution, and the availability of cost-effective alternative such as reverse cycle airconditioners that (even when outside temperatures are as low as 7°C) can deliver 5.9 times as much heat to the living areas as they use in power, the best option is not to install any new wood-heaters until clean ones have been developed that meet a satisfactory health-based standard. The Australian Lung Foundation recommends using alternative methods (to wood-heaters) for climate control The American Lung Association notes some of the dangerous chemicals in woodsmoke (dioxin, arsenic and formaldehyde”) and "strongly recommends using cleaner, less toxic sources of heat (than wood heating)”. Brian Moench, president of Utah Physicians for a Healthy Environment wrote: ‘If you are not a smoker, burning wood is probably the greatest threat to your health as anything that you do. But it is also a threat to your neighbors' health, as inappropriate as blowing cigarette smoke in the face of the passenger in the seat next to you. More than likely your neighbors are less than enthusiastic about sacrificing their health for your freedom to burn wood. A civilized society would suggest they shouldn't have to". 1) Australian Governments should recognise wood-heaters as a major source of urban air pollution and not allow the health benefits of reducing vehicle pollution to be counteracted by increased wood-heater pollution. 2) A National system should be implemented to measure PM2.5 in all locations that exceed the NEPM advisory PM2.5 standard, making the data publicly available on the web. 3) A new wood-heater standard (e.g. real-life emissions of 0.1 grams PM2.5 per kg firewood) should be developed immediately to ensure that health costs do not exceed the benefits of using wood heaters. 4) No new wood-heaters should be installed unless they meet the new standard. 5) Existing heaters that do not meet the standard to be gradually phased out, with all polluting heaters to be removed before houses are sold. 6) Funds needed for the transition to cleaner heating to be raised by a ‘polluter-pays’ levy on wood heaters equal to a proportion of their estimated health costs (e.g. 10% of the estimated health costs in year 1, increasing to 100% over 10 years). Similar policies are being considered elsewhere, e.g. a “polluter-pays” annual tax of 1500 DKK in Denmark. 7) Funding should also be provided to replace heaters that detrimentally impact the health or lifestyle of neighbours, in conjunction with stricter legal standards requiring polluters (and anyone who misleads consumers about the amount of pollution from wood heaters) to pay compensation for health damage from woodsmoke pollution. There is no safe level of PM2.5 pollution. In Europe, PM2.5 pollution is associated with more than 492,000 premature deaths, equivalent to a loss of almost 4.9 million years of life (YOLL)." In contrast, ozone (O3) pollution in Europe is estimated to cause 21,000 premature deaths. Emissions reduction from London’s Low Emission Zone (0.17 ug/m3) much less than exposure from wood burning (1.1 ug/m3) Although the reduction of 0.17 ug/m3 PM2.5 is welcome, tackling the annual average of 1.1 ug/m3 PM2.5 from woodsmoke pollution could achieve 6.5 times the benefits most likely for a fraction of the cost. Currently, about 17% of Australians aged 16 or over (13.6% of all Australians) smoke daily. Exposing everyone to a daily average of 25 ug/m3 was noted to be as bad as the entire population (including babies and elderly folk at risk of strokes or heart disease) smoking 3 cigarettes a day. If everyone is forced to smoke 3 cigarettes, as many PM2.5 are inhaled as when a sixth of the population (16.7%) chooses to smoke 18 cigarettes per day. This is substantially worse than the actual smoking rate (13.6% of the population). The table below of PM2.5 measurements in Armidale shows that a third of households using wood heating creates a major health problem for the entire community. PM2.5 Air pollution Measurements, Armidale, NSW, reproduced from the Armidale Dumaresq Council submission to the Senate Inquiry ‘Impacts on health of air quality in Australia’. Council’s submission reports that about a third of households use wood heating. 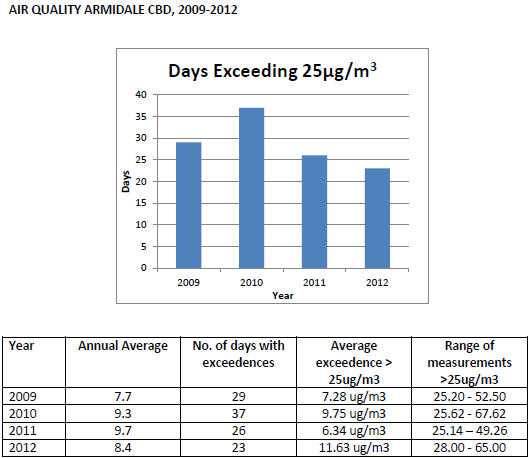 CBD measurements in winter months (June, July, August) averaged 15 to 16 ug/m3. Corresponding measurements in 1999 were 13.9 at in the CBD and 31.8 in the East Armidale residential area. Passive smoking (e.g. living with a smoker) produces similar increases in lung cancer (21-22%) and cardiovascular disease (CVD, 16-26%) to the increases (14-21%) in lung cancer and CVD (12-28%) from a 10 mg/m3 increase in PM2.5 pollution. Consequently, with only 15.9% of Australian adults smoking daily and a further 1.6% smoking weekly, but the entire population exposed to PM2.5 pollution from 5 to more than 8 mg/m3, the impact of air pollution on health is substantially greater than the effect of passive smoking. The evidence for cognitive impairment and genetic damage is quite strong. Several studies have linked PM2.5, PAH, or woodsmoke exposure to hastened cognitive decline in adults – increased exposure of 10 mg/m3 PM2.5 being equivalent to 2 additional years or 3 additional years of ageing. The Harvard University Nurses Health Study found a 39% increase in autism spectrum disorder of babies born to US mothers for an increase of 4.1 ug/m3 of PM2.5 exposure during pregnancy. The increased risk for exposure during the 3rd trimester of pregnancy was 60%. With wintertime (June, July, August) PM2.5 measurements averaging 31.8 ug/m3 in one Armidale residential area, a 60% increase in risk per 4.13 ug/m3 of exposure during the 3rd trimester would imply a 4.6-fold increase in risk for babies born at the end of winter. In developing countries, children whose mothers cook with wood (as opposed to kerosene) stoves have reduced IQ, poorer memory and worse social skills, e.g. in Belize, Kenya, Nepal and American Samoa, and also in Guatemala. In developed countries, genetic damage in babies, behavioural problems, childhood asthma and a 5 point reduction in IQ on starting school have all been linked to exposure of pregnant women to airborne PAH[21-23]. Of particular interest is the relatively low exposures required to cause the significant problems noted above – ambient benzo[a]pyrene was less than 0.5 ng/m3 and high exposure was defined as exposure greater than the median of 2.27 ng/m3 (sum of 8 PAH concentrations). These concentrations seem extremely low compared to average wintertime BaP concentrations of 1.30 ng/m3 and PAH concentrations of 8.62 (max 24.0 ng/m3 for a slightly wider set of PAH), in the small country town of Armidale, NSW. The NSW-EPA's Woodsmoke Control Options Report estimated that, over a 20-year period, the health costs of woodsmoke amount to more than $8 billion in NSW – an almost unbelievable $22,000 for every wood-heater. Three simple measures (not allowing new wood-heaters to be installed, removing existing wood-heaters when houses are sold and licensing fees) were estimated to reduce this by about 75%. Estimated costs and health benefits of other woodsmoke control options are shown in the table below. Improving wood-heater standards would represent 1% of the cost of meeting National air quality targets in Sydney, while achieving representing 66% of the benefits. Senate Inquiry report http://www.aph.gov.au/Parliamentary_Business/Committees/Senate/Community_Affairs/Completed_inquiries/2010-13/airquality/report/output/index). Para 6.13 notes that improving wood-heater standards would represent 1% of the cost of meeting National air quality targets in Sydney, while achieving representing 66% of the benefits. Para 6.35 blames wood heating industry reps for the failure of attempts to strengthen national wood-heater standards. Aggressive marketing by the wood heating industry fools people into thinking that new wood heaters are clean and environmentally friendly - http://woodsmoke.3sc.net/ahha-tactics The number of households using wood as the main form of heating in Sydney increased from 70,700 in 2008 to 83,300 in 2011. The graph below (from the second national in-service emissions study (NISE2)) shows in-service PM2.5 emissions for petrol vehicles The 2006-07 average PM2.5 emissions of 1 mg/km implies that a vehicle travelling 20,000 km will emit just 20 grams of PM2.5, less than the average domestic wood heater in the first hour after lighting. The abbreviations in the key: PV-S, PV-M and PV-L denote small, medium, large passenger vehicles; SUV-C and SUV-L denote compact and large SUV; LVC denotes light commercial vehicles. Governments currently spend considerable time and money trying to educate residents how to operate wood heaters correctly, and dealing with complaints from neighbours, because the current wood heater test does not reflect real-life emissions, and does not include the generally high level of emissions when lighting the heater. Launceston used part of its $2 million woodsmoke funding to teach people how to operate their heaters. CSIRO measured emissions from volunteers who knew their emissions were being measured and were so keen to operate their heaters correctly that many were re-fuelled in the middle of the night, instead of being left to smoulder. Despite this, emissions of Australian standard compliant heaters averaged 9.4 g/kg, so a heater burning Launceston’s average of 4 to 6 tonnes would emit 38 to 56 kg of PM2.5 per year, as much as 1900 to 2,800 new petrol-fuelled passenger cars. Refusing to buy existing excessively polluting wood-heaters would force industry to clean up their act. New efficient air-conditioners and heat pumps deliver up to 10 times as much heat as they use in electricity; cleaner heating is healthier and more affordable than buying firewood, and causes less global warming. 1. NSW OEH, Economic Appraisal of Wood Smoke Control Measures, 2011, AECOM Australia Pty Ltd. Prepared for the Office of Environment and Heritage. Available at:http://www.environment.nsw.gov.au/woodsmoke/smokecontrolopts.htm. 2. NEPCSC, National Environment Protection Council Service Corporation, Consultation regulation impact statement (CRIS) for reducing emissions from wood heaters. , in Available at http://www.scew.gov.au/strategic-priorities/clean-air-plan/woodheaters/index.html2013. 3. Hibberd, M., et al., Upper Hunter Valley Particle Characterization Study., 2013, CSIRO Marine & Atmospheric Research. Final report available at: http://www.environment.nsw.gov.au/aqms/uhaqmnfpcs.htm. 4. Lewtas, J., R.B. Zweidinger, and L. Cupitt. Mutagenicity, Tumorigenicity and Estimation of cancer risk from ambient aerosol and source emissions from woodsmoke and motor vehicles. in Air and Waste Management Association 84th Annual Meeting & Exhibition. 1991. Vancouver, BC, 1991. 5. Naeher, L., et al., Woodsmoke Health Effects: A Review. Inhalation Toxicology, 2007. 19(1): p. 67-106. 6. New Menzies Research Institute Tasmania research. Reduction in air pollution from wood heaters associated with reduced risk of death. http://www.media.utas.edu.au/general-news/all-news/reduction-in-air-pollution-from-wood-heaters-associated-with-reduced-risk-of-death 2013. 7. ALF. Woodsmoke and your Health: The Burning Issues. 2012. 8. ALA. American Lung Association Cautions Against Wood-burning and Urges Cleaner Alternatives for Winter Heat. 2008. 9. Brian Moench, Small minority who burn wood are responsible for much of our pollution, in Standard-Examiner2013, http://www.standard.net/stories/2013/10/15/small-minority-who-burn-wood-are-responsible-much-our-pollution (accessed March 2014). 10. Leeuw, F.d. and J. Horálek, eds. Assessment of the health impacts of exposure to PM2.5 at a European level. 2009, European Topic Centre on Air and Climate Change. Available at http://acm.eionet.europa.eu/reports/ETCACC_TP_2009_1_European_PM2.5_HIA: Bilthoven. 11. NSW EPA, Action for air - 2009 update. Available at: http://www.environment.nsw.gov.au/air/actionforair/ActionforAir2009.htm, 2009. 12. Crouse, D.L., et al., Risk of Non-accidental and Cardiovascular Mortality in Relation to Long-term Exposure to Low Concentrations of Fine Particulate Matter: A Canadian National-level Cohort Study. Environ Health Perspect, 2012. 13. Lung Association of Quebec, Wood heating: a public health issue for the Montréal region. http://www.pq.lung.ca/environment-environnement/wood_smoke-fumee_bois/enjeu-montreal/, 2009. 14. Pope Iii, C.A., et al., Lung cancer and cardiovascular disease mortality associated with ambient air pollution and cigarette smoke: shape of the exposure-response relationships. Environmental Health Perspectives, 2011. 119(11): p. 1616. 15. Scollo, M. and M. Winstanley, Tobacco in Australia: Facts and issues. 4th edn. Melbourne: Cancer Council Victoria. Available from www.TobaccoInAustralia.org.au. 2012. 16. HEPA filtres improve health. http://www.scientistlive.com/European-Science-News/Medical/HEPA_filtres_improve_health/19772/. 17. Weuve, J., et al., Exposure to Particulate Air Pollution and Cognitive Decline in Older Women. Arch Intern Med, 2012. 172(3): p. 219-227. 18. Kluss, T. Bad Air Means Bad News for Seniors’ Brainpower. http://www.geron.org/About%20Us/press-room/Archived%20Press%20Releases/80-2012-press-releases/1460-bad-air-means-bad-news-for-seniors-brainpower. 2012. 19. Munroe, R.L. and M. Gauvain, Exposure to open-fire cooking and cognitive performance in children. International Journal of Environmental Health Research, 2012. 22(2): p. 156-164. 20. Dix-Cooper, L., et al., Neurodevelopmental performance among school age children in rural Guatemala is associated with prenatal and postnatal exposure to carbon monoxide, a marker for exposure to woodsmoke. NeuroToxicology, 2011. 33(2): p. 246–254. 21. Perera, F.P., et al., Prenatal Airborne Polycyclic Aromatic Hydrocarbon Exposure and Child IQ at Age 5 Years. Pediatrics, 2009. 124(2): p. e195-202. 22. Perera, F.P., et al., Prenatal Polycyclic Aromatic Hydrocarbon (PAH) Exposure and Child Behavior at age 6-7. Environ Health Perspect, 2012. 23. Perera, F.P., et al., PAH/Aromatic DNA Adducts in Cord Blood and Behavior Scores in New York City Children. Environ Health Perspect, 2011. 24. NISE2, Second National In-Service Emissions Study: Technical Summary, 2009, Australian Government Department of the Environment. Available at: http://www.environment.gov.au/archive/transport/publications/nise2.html. 25. Meyer, C.P., et al., Measurement of real-world PM10 emission factors and emission profiles from woodheaters by in situ source monitoring and atmospheric verification methods, 2008, CSIRO Marine and Atmospheric Research (CMAR), (available at: http://www.environment.gov.au/atmosphere/airquality/publications/emission-factor.html ). 27. Mainville, N., Fuelling a Biomess: Why Burning Trees for Energy Will Harm People, the Climate and Forests, in Available at: http://www.greenpeace.org/canada/en/recent/Burning-trees-for-energy-puts-Canadian-forests-and-climate-at-risk-Greenpeace/2011, Greenpeace Canada. 28. Fuller, G.W., et al., Contribution Of Wood Burning To PM10 In London. Atmospheric Environment, 2014.